I get a lot of people telling me that I'm doing so well or asking me if I'm really doing as well as I seem. And the answer is: mostly. The thing is, I don't spend all day crying or anything like that although I have days where I feel mopey or days like today where I'm grouchy about how people who don't seem to deserve it not only get pregnant but have healthy pregnancies and deliveries. Tonight I had one of those rough spots. I've been working on shadow boxes for Autumn and Garrett. I'm sure you can guess that it's a bittersweet project. And yesterday my doctor said she wants to get a second opinion on whether or not we might be able to safely have another baby someday. That's a story for another post, but it was on my mind most of the day. Then while we were snuggling and snacking on popcorn, Autumn asked me, "are we going to have another baby?" I told her that I wasn't sure but maybe someday we might. "Will the baby's name be Garrett?" "No, baby girl, Garrett is Garrett just like Autumn is Autumn. If we have another baby, he or she will have their own name." Autumn and I talked a little more about babies and what she was like as a baby. 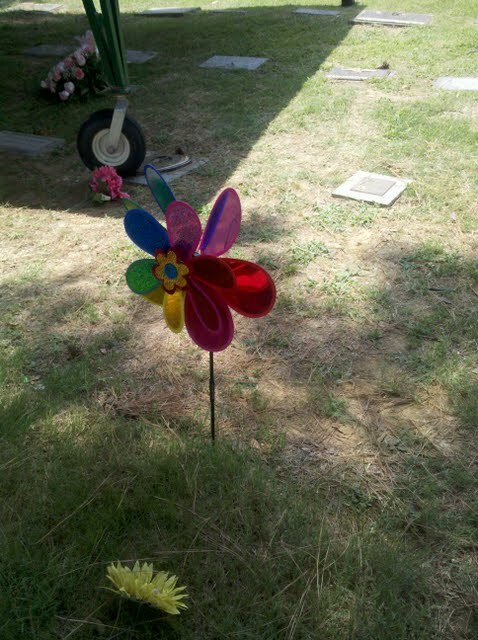 I overheard her at some point telling Mike that when she was a baby, she lived in heaven with Jesus like baby Garrett. Of course, putting her to bed, Autumn wanted me to read the nursery rhyme book. I nearly lost it while reading Rock-a-bye Baby to her. But, I just hugged Autumn a little closer, took a deep breath, and was able to hang on. I see the wind. I see it in the branches outside the playroom window. In the clouds rushing across the sky. In the pinwheel, merrily spinning at Garrett's grave. And, perhaps as I write, I can remind myself that just because I can't see the wind...it doesn't mean that He isn't there.